In today’s world of plastic money and internet shopping, fraud has become a prevalent problem. 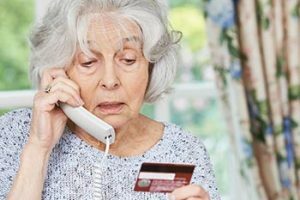 Seniors are commonly targeted through scam calls, credit card fraud, and identity theft. PeachTree Place Assisted Living in West Haven, Ogden, and Salt Lake City, Utah is particularly concerned with senior fraud prevention. Telemarketing is a common way for businesses to reach out to the masses in search of new customers. Fraudulent telemarketers, however, use devious tactics through scam calls to seniors to convince gullible victims to hand over personal information. They may offer a time-sensitive deal that is only available “right now”. The scammers might lead the victim to believe they have won a prize, but in order to collect the prize, they have to pay a handling fee. Mail and email fraud are similar to telemarketing fraud, creating a correspondence that leads the recipient to believe that an insurance policy has expired, or that they have received an amazing prize that they can claim if they purchase something. The best prevention is education. Help your aging loved one know how they can protect themselves from possible online fraud, senior identity theft or credit card fraud. Inform them about any new scams that have been going around. Don’t give bank account, social security, or credit card numbers over the phone unless you have made the call yourself and are certain you have reached the correct institution. You can always tell the caller that you don’t give personal information over the phone and that you will call the company back. Do not comply if the caller asks you to pay a “handling fee”, especially if they have just offered you something for free. Never buy something on the spot, especially when being pressured by someone you don’t know. You should take the time to discuss the purchase with a family member or trusted friend. Many seniors are conscientious about being polite over the phone and in person. It is helpful to let them know they can hang up on someone if the conversation is uncomfortable, or if they feel they are being pressured to do something they do not want to do. Family members can role play with their senior family member to help them get comfortable with terminating an unwanted phone call or conversation. This will help them gain the confidence to be firm in protecting themselves from possible fraud. Peachtree Place Assisted Living encourages family members and friends to be aware of scammers and their senior fraud practices. As a support system to the senior in your life, you can do a lot to prepare them to recognize possible scams and empower them to protect themselves.